It’s 30 seconds before you take the stage to give your presentation. Your heart begins to race. The first line of your presentation runs through your head. Your palms sweat. As you start to walk on stage, your focus turns inward. Suddenly, even after all your preparation, the presentation becomes all about you and your performance! In that moment, you know without a doubt that you have become your own worst enemy. Right? Those three threats? Distraction, competition, and commoditization. And the key to defeating those big, bad distractions is by writing a presentation that fascinates your audience. 1. Distraction: Is your presentation connecting or missing the mark? Hogshead cites a study from IBM that says you've only got nine seconds to fascinate your audience. How are you using those nine precious seconds? Your introduction needs to be an act of disruption! When your audience enters a room, their thoughts, feelings, and never ending to-do lists fill their minds. Your speech is an interruption in their day. If you fail to captivate immediately or “front load your value,” then you lose the war to distractions. Don’t waste those precious moments with “thank you” or “I’m so happy to be here” or a “funny thing happened with my dog this morning.” The first sentence of your speech must instantly engage your audience. Make them want to know more about your topic, more about you, and more about your uniquely added value. A well-crafted and fascinating first line is the best defense against distraction. 2. 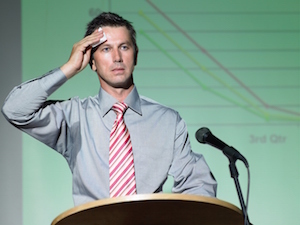 Competition: Is your presentation forgettable? I recently talked to a speaker who was failing to get traction. He told me that his content was great, and he didn’t know what he was doing wrong. I watched his video. I witnessed stories that I've heard a million times (Oh Starfish story will you please die, already? If you don’t know that story, be grateful), studies that were cited by nearly all speakers in his category, and the same examples that everyone else was using. There was nothing in there that I hadn't heard a thousand times from speakers who were much more famous than him. To combat this, use the notecard test. If I could run up on stage, swipe your notecards or the clicker to your PowerPoint slides and give your presentation, your speech isn’t different enough. How can you add your viewpoints, your stories, your rant, to make it your own and eliminate your competition? 3. Commoditization: Are you easily replaceable? The side effect of blending in with the competition, not offering a view point, and delivering the same old song and dance as everyone else, is that you are REPLACEABLE! You've made yourself a commodity like milk. It doesn't matter what brand of milk you buy, milk is milk. The dairy industry realizes that it competes on price and most of the time consumers buy the lowest price version. You deserve to be better than generic milk! If you and Esmeralda both speak on leadership, talk about the same content, and she charges $1,000 less than you do, Esmeralda (that witch) is going to get the gig. You need to make an audacious breakthrough and figure out how to position yourself so that they want ONLY YOU! The key to combating commoditization is to discover your .01% difference by knowing your communication strengths and how you fascinate. Luckily, Hogshead has made it easy to find out how you’re different. 1. Write an opening line that instantly grabs the audience’s attention and makes them want to know more. 2. Ruthlessly audit your presentations - if someone else could give it, you need to challenge yourself to creating one that uniquely expresses your viewpoint. 3. Know your .01 difference. Find out how the world sees you with the Fascination Advantage system. So for your next presentation, stop worrying about stage fright. It’s time to focus instead on distraction, competition, and commoditization.